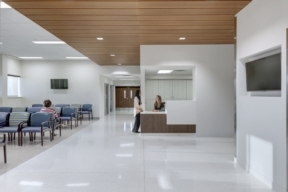 In January 2017, United Regional’s Bridwell Center for Emergency Care expansion and renovation project was completed, doubling the square footage of the existing facility (to over 42,000 sq. ft.). Built to accommodate approximately 75,000 patients annually, the expansion/renovation was an improvement to the previous Emergency Room built in 1999 to provide for half of the volume per year. 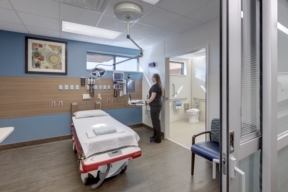 The Bridwell Center for Emergency Care houses two trauma rooms, 43 universal treatment rooms, eight patient evaluation rooms, six rapid treatment rooms and two consultation rooms. 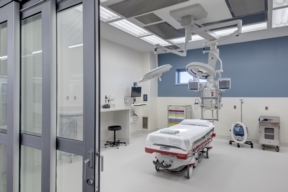 The facility also includes a 10-bed clinical decision unit, disaster preparedness area, expanded ambulance bays, and a new interior walkway from the ER entrance to the Bethania Building. 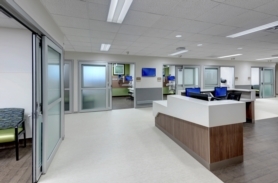 This new facility is designed to complement expert emergency care with patient comfort, convenience and privacy, advancing further United Regional’s passion of providing excellence in health care for the communities we serve. Just what our ER staff designed. Our ER physicians, nurses and other staff wanted a facility designed to provide patients with faster access to expert care. With their input into the facility’s design, a rapid assessment and treatment area is provided where patients will receive prompt evaluation and care. Many patients can be discharged home from this area, while other patients may need more extensive care which they will receive in another treatment area. Of course patients with life-threatening conditions and injuries will have immediate access to specialized treatment just as they do now. Just what our patients requested. United Regional wanted to ensure that the new ER provided an improved experience for our patients; so we asked former patients and their family members what they wanted and incorporated their requests into our plan. The modern facility provides large treatment rooms so that family members can comfortably be with their loved ones. Each treatment room is a private room with a flat screen television and an individual thermostat for personal climate control. Patients receive faster access to expert care in a comfortable environment. When every second counts, patients at United Regional’s ER have immediate access to the resources of a full service hospital – a cardiac catheterization lab, operating suites, intensive care, advanced diagnostics, life-saving technology – all without having to travel to another facility. 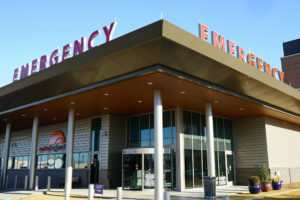 And United Regional is designated as a Level II Trauma Center – meaning that we have a trauma surgeon available at all times and that we can manage the most severely injured trauma patients from ER to operating suites to intensive care and through to discharge . So, no matter what your injury or illness, patients receive expert emergency treatment provided by emergency medicine physicians and a full complement of physician specialists working together to coordinate your care.